Everything Sunday was supposed to be for the Cardinals – everything the Cards needed it to be – it wasn’t. Bruce Arians called the loss to the Falcons disappointing, lots of players called it disappointing, but more importantly, they were asking themselves why it happened the way it did when they simply couldn’t afford such a performance. The offense wasn’t good, and we’ll get to that in a moment. But from the time that Steven Jackson – Steven Jackson? – reeled off a 55-yard run on the game’s first possession, it was the defense that simply didn’t do enough Sunday. No, the offense didn’t do enough either, but this year, with this team, the defense is held to the higher standard. The defense will be what takes the Cardinals however far they will go. Jackson gained 101 yards. The Cardinals never give up 100 yards to a running back. Julio Jones put Patrick Peterson on blast to the tune of a career-high 189 yards, and Harry Douglas added 116 himself – you know, as long as Roddy White was hurt, why not? The last time the Cardinals gave up at least 100 yards in a game to a running back and two receivers? 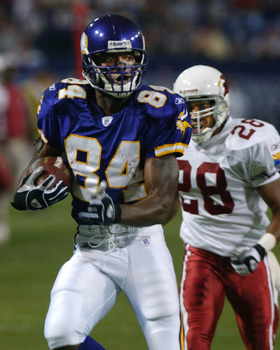 Way (way) back on Nov. 12, 2000, when Robert Smith rushed for 117 yards, Cris Carter had 119 yards receiving and Randy Moss has 104 for the Vikings. Of course, that was for a bad, bad Cardinals team that went through a midseason coaching change. This was by a defense that not only is better, but when it is playing well is one of the best in the league. Adversity has come to visit, linebacker Larry Foote said. With four games left – including the last three within the division – the Cardinals have to figure out how to overcome. It starts on defense. — Stanton did seem to find a little bit of a groove after a very slow start. But the Cards kill themselves over and over. A Michael Floyd fumble here. A Ted Larsen holding penalty there. An incomplete bomb to Ted Ginn on third-and-2. The first thing Stanton talked about after the game was converting third downs, of which the Cards did only once Sunday. — Andre Ellington said he’ll be OK after his hip pointer – he said it was a different injury than the one he has been dealing with – but the run game didn’t help again. Falling behind so big so early didn’t help, but Ellington and backup Marion Grice combined for just 10 rushing attempts, for just 35 yards. — There were too many important players standing out of uniform on the sideline during the game – Larry Fitzgerald, Darnell Dockett, John Abraham – to not make you think if all the injuries are starting to catch up to this team. — The Cardinals do get linebacker Matt Shaughnessy back this week and he can play against the Chiefs. That isn’t a small thing. — Jaron Brown had his best game, with a team-best seven catches for 75 yards in Fitz’s absence, and absorbed one wicked blow late as he was tackled. Brown was fine with that, he said. He wasn’t fine with the ball that glanced off his hands early in the game, which turned into the Falcons’ first interception. The pass looked too high from Stanton, but to that Brown shrugged off. — Lyle Sendlein, who used to be an offensive captain before Carson Palmer took a foothold in the locker room, is wearing the “C” on his uniform again now that Palmer is out for the season. — With the high-ankle sprain of Paul Fanaika, it sure looks like Jonathan Cooper will be in the lineup as a starting guard for a little while at least. Even before Fanaika got hurt, Cooper was swapping series with Ted Larsen at left guard. It looked like the effort to reintroduce him into the lineup had begun. — Arians said he didn’t challenge the 41-yard catch by Julio Jones in the second half – the one in which numerous fans mentioned to me on Twitter Jones only got one foot down – because the coaches upstairs never saw a replay. Peterson was called for holding on the play, but a challenge could have saved the Cards 36 yards if the catch had been negated. — The punt team nearly was burned on a 70-yard punt return touchdown by Devin Hester. But Hester was called for a facemask while trying to straight-arm punter Drew Butler, and then the Falcons were flagged for another 15-yard penalty for complaining about that call. Cost the Falcons four points in the end (Atlanta later got a field goal). Hester afterward insisted it was a bad call. — That’s it from 30,000 feet. The Cardinals go back to work tomorrow, trying desperately to right what’s wrong. Considering the Cardinals are on a three-game losing streak, the mood was, dare I say, pretty good in the locker room this week. Coach Ken Whisenhunt, Adrian Wilson, Darnell Dockett, Larry Fitzgerald – I mean, don’t get me wrong, no one is happy with the slide. I’m not sure if it’s the juice provided when the 49ers come to town, or “Monday Night Football,” or what. Clearly, though, the Cards seem in a good place mentally. Certainly there isn’t a vibe of being overwhelmed against the Niners. Not that there would be – this is a team they face twice a season. Familiarity usually takes worry off the table. The Cardinals say their minds are in the right place. It feels that way. — The 49ers have the top-ranked pass defense in the league. That doesn’t seem to bode well for getting the ball to Larry Fitzgerald, but then again, the Niners had a great pass defense last year and Fitz blew up against them out at University of Phoenix Stadium (7 catches, 149 yards). Quarterback John Skelton also ended up with a pretty good day, with three TD passes after coming in in relief of a concussed Kevin Kolb. The key, of course, will be keeping Skelton upright under the San Francisco pass rush. That will be a key every week with this team, obviously. — And speaking of Fitz, he knows the questions are coming every time he has a game without many stats – we went through it early last year too – about getting him the ball. Fitzgerald had a pretty good stretch of four straight games of producing before Minnesota, whose defense was all about shutting him down, it seemed. Right now, Fitz is on pace for 91 catches, 1,049 yards and 7 touchdowns. But this is a different Fitz that 2006 too. — Remember former Cardinals guard-turned-tackle-turned-Pro Bowl guard in Dallas, Leonard Davis? Good old “Bigg,” who left as a free agent just as Whisenhunt was coming in, plays for San Francisco these days. He gets work in certain packages and is used as a sixth offensive lineman. — Patrick Peterson will likely get a lot of Michael Crabtree Monday, since Crabtree is the 49ers best receiver. But the Cards’ cornerback is most looking forward to meeting Randy Moss, who plays – although not much – for the Niners. — Running back LaRod Stephens-Howling will try to follow up his first 100-yard game with another productive outing, something the Cards need. Stephens-Howling, who is playing under a one-year tender offer after restricted free agency, is scheduled to be an unrestricted free agent after the season. General manager Rod Graves said in training camp the Cardinals would like to sign Stephens-Howling to an extension, but thus far talks have been slow. — So far, Peterson’s follow-up to his electrifying rookie season returning punts has been anything but. His long return is 26 yards and he has averaged only 8.8 yards a return as teams have clearly made preventing him from breaking one a priority. Against the Vikings, Chris Kluwe kept kicking high punts short and Peterson had to scramble just to catch them. — This is a big one. Obviously. If the Cardinals have shown anything over the past couple years, it’s that they are very tough at home. They need to make that matter Monday. Steve Breaston isn’t going to brag. 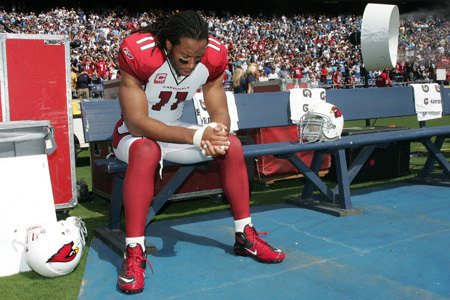 He doesn’t look all that comfortable when it’s suggested his presence “helps” Larry Fitzgerald. Fitz is a great player, Breaston knows, and that doesn’t go away whether Breaston is out of the lineup or not. Then again, it does make a difference with Breaston in there. “I don’t think teams were worried about some of those young players we had on the field,” coach Ken Whisenhunt said of the rookie wideouts playing when Breaston and Early Doucet were injured. Breaston does draw more attention. He does have the speed to stretch the field and open up holes for Fitz – and others – underneath. But hey, maybe I am over-analyzing. — So the Cards head to Minnesota tomorrow with opportunity. Normally this trip to play the Vikings would seem to be an uphill climb, especially with the way the Cards have juggled QBs. But there is little question the Vikings are in a worse place as a team, after jettisoning Randy Moss and injury issues and stories all week about how coach Brad Childress is in trouble. If the Cards can handle Adrian Peterson – at least not let him run wild – and not turn it over, there is no reason to think the Cards can’t steal one. Here’s hoping they give themselves that chance. Peterson has none this year. And ESPN’s Chris Mortensen pointed out this great stat about Walter Payton (and not to compare Hightower, or even Peterson, with Payton): In Payton’s 14 seasons, he had at least five fumbles in all but one season. Payton had seasons of nine, 11, 13 and 16 fumbles. Astonishing. — OK, so it’s in large part an indictment of the struggling offense at this point. But do you realize the Cardinals have more return touchdowns (KOR by The Hyphen, interception by DRC, four fumbles by Levi Brown, Kerry Rhodes (twice) and Gerald Hayes to total six) as they do rushing (five) or passing (five)? Those six return TDs, by the way, lead the NFL. — When it was suggested the Cards might not have bothered to watch the Vikings games with Moss, since he is gone now, Whisenhunt said the Cards watched every game this season of the Vikings. Moss’ absence will definitely change how the Cards deal with them. — I tried to ask about right tackle Brandon Keith’s play. It was actually praised this week by one-time offensive lineman Ben Muth on Football Outsiders. But Whisenhunt was having none of it. At least not yet. Fair enough. Noise has bothered Keith this season. The Cards need both he and Levi Brown to hold up on the outside. — Cards quarterback Derek Anderson likes his humor. Talking about Favre this week, Anderson quipped, “Brett Favre is as old as my dad.” Anderson never necessarily idolized Favre, but liked the way he played because “he always played like a kid.” That’s what Anderson wants to be able to do. As for Favre’s crazy streak of consecutive games played, Anderson shook his head. “It’s a testament to the lines he played behind because, whatever he’s done, 2,000 games he’s played straight, guys get beat up and a lot of times can’t even play 16 games,” Anderson said. (The streak, by the way, will be 293 once Favre takes a snap against the Cards). — Don’t forget, with the rest of the country changing clocks in the wee hours of Sunday morning, the Vikings’ kickoff will be at 11 a.m. Arizona time and not 10 a.m. For me, it’s on to Minnesota. Guess we will hear that blasted horn soon enough. Running back Beanie Wells said it was an allergic reaction to a lubricant injection for his right knee — and nothing that happened in a game — Monday that caused the swelling that has limited him in practice. Because of that, he and coach Ken Whisenhunt are hopeful it will have dissipated by tomorrow and allow Wells to go back to work. Both stress nothing is wrong structurally. The procedure isn’t uncommon, Whisenhunt said. Steve Breaston has used it. Whisenhunt himself has used to to ease knee discomfort. It’s just that Wells’ knee reacted badly. He plans to practice Friday. Whisenhunt said Wells definitely needs some work Friday in order to play Sunday. “You want to go out and play full speed, not when your knee swells up and I can barely bend my knee,” Wells said. Whisenhunt said the lubricant is called “Orthovisc.” “It’s nothing more than a way to help the knee, to improve the knee,” Whisenhunt said. It’s a method you do periodically, to “help the knee settle.” Whisenhunt said it is effective. — For everyone still wondering about the Cardinals offensive line, former lineman Ben Muth writes up a details appraisal of the unit — and is fairly complementary — right here for Football Outsiders. — The Big Red Rage is tonight at 6 p.m. at Majerle’s at Chandler Fashion Mall. Adrian Wilson’s guest is cornerback Michael Adams. — Cards HQ, normally televised on FSAZ Wednesday nights, will debut tonight at 6:30 because of last night’s Suns game. This week’s edition includes the decision to start Derek Anderson, a look at the Cardinals new “Hammer” formation and ‘Wired’ with Stephen Spach. — Finally, remember my comments about Randy Moss (which I stand by, BTW)? I never said he wouldn’t make the Hall of Fame, but I insisted he wouldn’t be a first-ballot guy. Many disagreed. Well, Jason Whitlock crystallized my thoughts right at the top of this column. The Cardinals were in the middle of their locker room media session/lunch time when the news (first pointed out by kicker Jay Feely, at least to me) broke of the Vikings releasing wide receiver Randy Moss. It’d be stunning news anyway, but the Cardinals go to Minnesota Sunday. Moss, despite being a vested veteran, must clear waivers so every team has a chance to claim in in the reverse order of standings — meaning Buffalo gets first crack, New England last. We’ll see if a team is will to risk going after Moss for $3+ million for the balance of the season, or if he reaches free agency. Would it really be a shock if the Patriots took him back, and that Belichick essentially ends up renting Moss to the Vikings for just a few weeks in exchange for a valuable third-round pick? Cornerback Greg Toler said he just wants to see the Cards’ defense “stay together, regardless of who they have on the field.” Dominique Rodgers-Cromartie, on the other hand, sounded disappointed. Then there was wide receiver Larry Fitzgerald, a friend of Moss who was a ballboy for the Vikings back when Moss and Cris Carter were in their Minnesota heyday. A few weeks ago, Fitzgerald was just talking about how Moss would be happy going back to Minnesota since he still has a house and loves the outdoors. Monday, Fitz was (briefly) talking about Moss leaving Minnesota once again. Interesting today that, on the day Randy Moss was traded by the Patriots to the Vikings than Kent Somers addressed the elephant in the room when it comes to the Cards’ current quarterback situation — the future of wide receiver Larry Fitzgerald. The first thing that crossed my mind when it came to Moss is, while the guy is a great talent, he cannot be considered one of the greats. Why? Because a great is not traded four times. I understand one deal, or one free-agent jump at the end of a career. It happens, and it happens to a lot of talented players. But Moss has now been traded from Minnesota to Oakland to New England and back to Minnesota — shockingly so, by the way, because of the way he acted there the first time — and he still can play at a high level. Only one reason for that. He’s not worth it long-term. Fitz, on the other hand, is worth it. That’s why, as Kent writes and as those of us around the team have talked about at length, figuring out the quarterback situation is so huge. Fitzgerald is basically in a contract year this year. His deal is set to expire after the 2011 season and the Cards can’t franchise or trade him (no-trade clause) so they need to extend him. And they want to. Of course, not only can Fitzgerald ask for the moon after this season, he will also be deciding if he wants to. A wide receiver is only as good as the guy throwing him the ball — Fitz’s numbers are down this season, and it’s not because he suddenly is playing poorly, or because he was hurt. It’s because of the issues at QB. I am sure that will be a topic discussed many, many more times in the future. Today, it just underscores why some talented guys bounce around this league despite their skills, and others with skills are to be held on to tight. I had wanted to touch on a couple of other things this morning, but they’ll have to wait given the growing story of Larry Fitzgerald, the Twitter page of his brother Marcus and Fitz getting just four catches Sunday. Marcus Fitzgerald took to Twitter and said some things — not surprising, really coming from a little brother — about Kurt Warner not getting the ball enough to his sibling. The key tweet was one where Marcus said Larry had texted him angry he wasn’t getting the ball more. In the day-plus that has followed, Marcus Fitzgerald apparently backtracked and then deleted the tweets, but by then too many outlets had recounted the situation. I first saw the remarks early yesterday when a fan noted it on a message board. I thought about mentioning it but I was hoping to talk to Larry first. Instead, it’s blown up nationally (The ironic part of this whole thing is that Larry is on Twitter and he goes out of his way to be as non-controversial as possible). Fitz is also careful publicly, which is why — and of course, I am guessing now — he was probably cringing at his brother’s Twitter comments. In the Jacksonville locker room, someone asked Fitz about looking upset at one point in Sunday’s game when he was open down the middle. Fitz smiled and talked about how he was just tired in the humidity and that’s why his body language was what it was. Another reporter, who wasn’t there for the first answer, came up moments later and brought up the same thing, and Fitz again smiled and insisted it just was the weather. Of course, Fitz had a touchdown in hand by the time the game was over. He could have had a second. The TD pass to running back Jason Wright was designed for Fitz; Wright’s route was supposed to clear the area except the safety covering Wright was so badly beat Warner just threw it to Wright. But if you watch the play, Fitz was wide open right behind Wright (and, personally, looked a bit disappointed Wright stepped in front of him). But here’s the deal: If indeed little brother is telling the truth (and why would he lie?) and Fitz was upset, it wasn’t Fitz putting it out for public consumption. After the game, Fitzgerald stood in the locker room telling everyone the victory was a huge deal, and if he was ticked at that point, he did a marvelous job to hide it. I’d expect star receivers like Boldin and Fitzgerald to be unhappy if they don’t get the ball. I expect Warner to be unhappy if Whisenhunt suddenly started calling 60 percent run plays. I’d expect Darnell Dockett to be ticked if they suddenly said he had to play nose tackle so someone else could rush the passer. What you can’t have is guys having their moods take a dive after victories, especially ones in which everything seemed to click. And again, that didn’t look like it happened with Fitzgerald. Now, whether or not he wants to talk to his little brother about the very public impact of Twitter ….